Moving into your custom built dream home is exciting. But, how can you make your environment more soothing? Bringing nature inside can transform a dull room into an enticing space that draws your attention while providing a comfortable place to relax. When people think of natural elements they usually resort to lots of wood and stone. These are good base elements, but there is more to achieving a calm, peaceful home then laying bamboo floors and installing granite countertops. Here are a few simple ways to enjoy all that nature has to offer — from the inside. Brick adds a lot of texture and style to a room. Maybe that is why so many people find it appealing. Able to work in any style home – from the urban loft apartment to the country estate – brick can make a beautiful addition if used correctly. 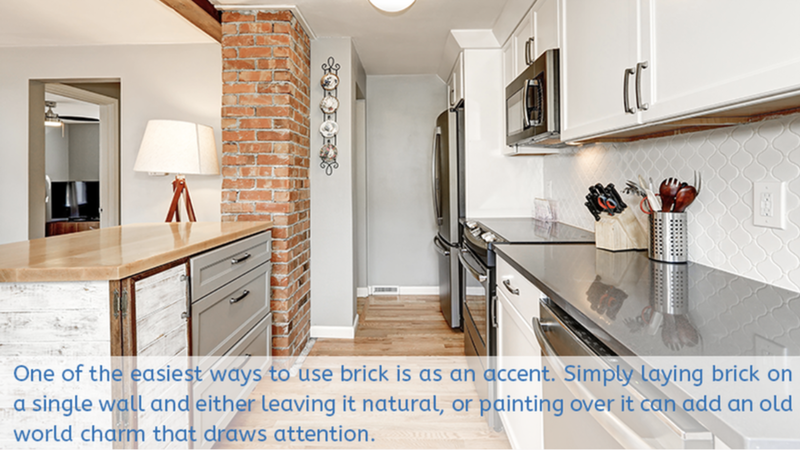 One of the easiest ways to use brick is as an accent. Simply laying brick on a single wall and either leaving it natural, or painting over it can add an old-world charm that draws attention. Use it as a focal point to draw the eye to a fireplace, artwork or some other architectural design element in the room. If there is one room of the house that you can create a real getaway, it is the bathroom. Wood is a wonderful design element. Using it to create a sauna-like room will give the bath a rich look and comfortable feel. Wood is typically used for a more rustic flare, but wooden walls that have been refurbished until they shine can also give the room a more natural, urban look. Offering clean lines and lots of light, wooden walls throughout the bath (including the shower) creates a relaxing sauna feel, making your bath a real sanctuary. Pairing wooden walls or even custom wooden countertops with natural stone can turn a drab bathroom into a one-of-a-kind showplace. Forget those fake ferns; your home needs plenty of real-life plants and flowers! Whether you have a green thumb or not, it doesn’t matter. Today’s modern home features a variety of easy-to-maintain succulents, cactus and potted bulbs. From the coffee table and desk top to the foyer and even powder room, flowers and plants make a house feel like home. Add a hanging herb garden to the kitchen for a more practical touch of style, or simply invest in weekly flower bouquets to brighten up the room and your mood. Invite nature inside by opening your windows – wide! Remove curtains and drapes that hide your view of the outside and let in that sunshine. Allowing a cool breeze to waft through the house also gives your home a more relaxed and calming feel. If you live in a colder climate which prohibits you from opening the windows, consider installing larger panes or even skylights to take advantage of natural light and the heat that comes along with it. There are a lot of things to consider when designing your custom home. Finding ways to incorporate plenty of natural elements into your style and design is a good way to create the kind of comfortable, yet stylish home you see in the magazines. Looking for more design aid on your custom home? Schedule a consultation with Nea Maya today!